“Trennel, trunnel, trenail, treenail“ – great words for a rather humble object, one that we’ve all seen when drawing nautical timbers with the TDP. It seems a rather basic way of fastening together a ship, but wood has the major advantage that unlike copper or iron, it doesn’t corrode in seawater. I’d never given much thought to how they were made, although once you think of it, obviously you’d need an awful lot even for one ship, let alone a fleet. 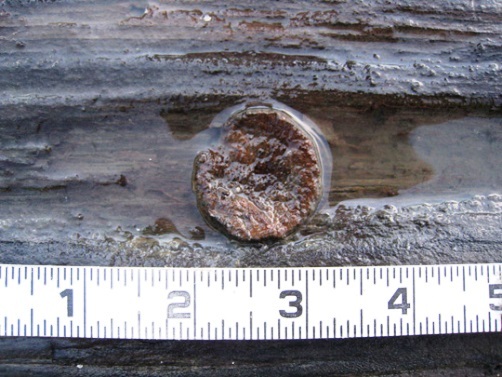 Then I read about the excavations at Pacific Wharf in Rotherhithe, where treenails were found in the ships’ timbers re-used in 17th and 18th century river walls. They came in three sizes there, and apparently there was a “rule of thumb” for the relation of treenail size to size of vessel, one inch for every 100 feet of ship. They were all made of oak, and were not round, but eight or sixteen-sided. The logs to make them were cut into four foot lengths, and then split into billets, not sawn, as this made them stronger. The rough billets were trimmed to a square section with a keen hatchet, then shaped to eight or sixteen sides with a draw knife. There is a mid 19th century picture here, showing a man making treenails, holding the wood between his body and a notched wooden support, and pushing the draw knife away from him. The head of the treenail was usually left square, or at least larger than the shank, to act as a head. The treenail was hammered into the hole, and the head cut off flush with the planking, and then usually split and expanded to lock tight. A wedge might be driven in to lock the treenail in. If you’ve ever drawn a treenail which is round, but has a square shape within it, you’ve seen the wedge. There is a good photo of this on the Institute of Nautical Archaeology’s website, about the 1619 Warwick Wreck Project in Bermuda (we’d all like to work on this project! Ed). 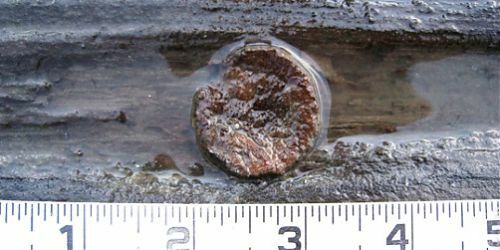 Sawn-off blunt points and heads of treenails are found on post-medieval waterfront sites in London. I checked to see if the London Archaeological Archive and Research Centre (search term trenail) had any, and they have fifty, mostly from the Baynards Castle site in the City, but the don’t illustrate any of them online. “The making of treenails for ship, barge and boat building along the Thames was a specialised craft, with large yards (such as that at Blackwall) and naval facilities having their own treenail makers even as late as the mid 19th century”. I thought I might find some in online directories, although these are a bit late for what was presumably the heyday of treenail making. But in the Post Office London Directory for 1882, George Stephen Morgan is listed as a treenail maker, at 36 Gill Street, Limehouse, and he’s there two years later, in 1884, along with James G Morgan in Poplar, and again in 1895 at a different Limehouse address. In 1891, a firm called Bayliss, Jones & Bayliss are listed as Railway Key and Treenail Manufacturers in Cannon Street, by which time possibly the treenails are being made for the railways. Even by 1915, the British Timber Works in Dorking are still listed as making treenails. I expect there’s a good deal more to know about treenails and their manufacture, I still do not really understand when or why treenails were used in preference to nails. If I find anything interesting I will keep you posted.